Becky Crawford purchased an Air Evac Lifeteam membership (part of the AirMedCare Network), in 2012. “You just never know when you might need it,” she told her husband, Paul. The Fort Payne, Ala., family – Paul, Becky, daughter Emma Campbell and son Liam – had just returned from a spring break vacation. Paul and Becky are both teachers, and Sunday, March 30, 2014, was the day for laundry and for yard work. Sunday, March 30, 2014, was also the day the Crawford family “needed” the Air Evac membership. Liam, 4 years old at the time, was on his way to spend the night with his grandparents. Before leaving, however, he ran into the yard to say goodbye to his dad. Paul was mowing the grass, and did not hear Liam. The young boy tripped on a rock, sending him into the lawnmower’s blades as Paul was backing up. “It was the perfect storm and it happened in a split second,” Becky said. Liam’s right leg was cut from just above the hip all the way down to his knee. Firefighters arrived at the home and determined that Liam would need to be flown to a higher level of care. Becky told them her family had an Air Evac membership. “Does that matter?” she asked. “Yes, that matters!” the firefighters answered. The Air Evac Lifeteam crew from Scottsboro, Ala., landed at the fairgrounds just five blocks from the Crawford home and flew the young boy to T.C. Thompson’s Children’s Hospital in Chattanooga, Tenn.
“They had to get him there quickly because his leg was bleeding so badly, and they wanted to keep the tissue viable and try to save his leg,” Becky said. 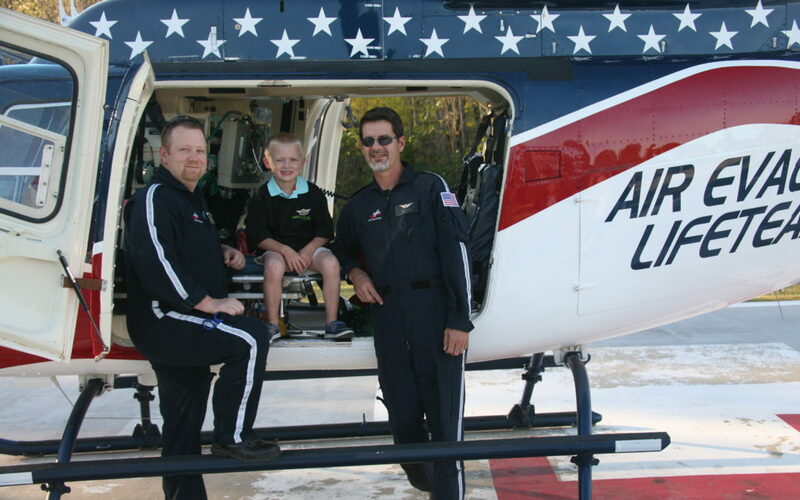 Flight nurse John Baker and flight paramedic Dustin Paseur kept Liam talking and calm on the trip from Fort Payne to Chattanooga. Liam spent 16 days in the Pediatric Intensive Care Unit, and has since endured 15 surgeries. Becky praised everyone involved – from the firefighters and EMS unit, to Air Evac Lifeteam and the staff at the hospital. Liam was released from the doctor’s care on January 19, 2015. An Air Evac membership is just $65 per year, and covers your entire household. If you are flown by Air Evac Lifeteam (or any of the AirMedCare Network participating providers), for a life- or limb-threatening injury or illness, whatever your insurance pays is considered payment in full. There are more than 2 million members covered by 245 air medical locations across 32 states. For more information, please visit lifeteam.net/membership-overview/.